These incredible Chocolate Mint Brownies feature a decadent ganache topping, creamy mint filling, and a moist, rich brownie base. Love chocolate and mint? 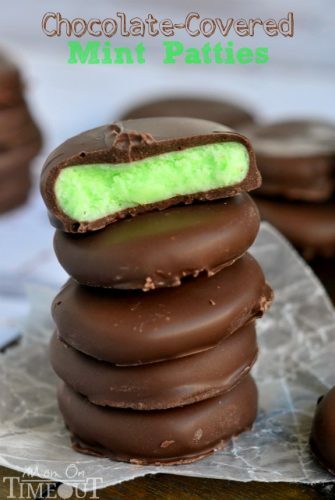 Check out these Chocolate Mint Cream Cheese Buttons, this Mint Chocolate Chip Cheese Ball, and these Chocolate Mint Patties. 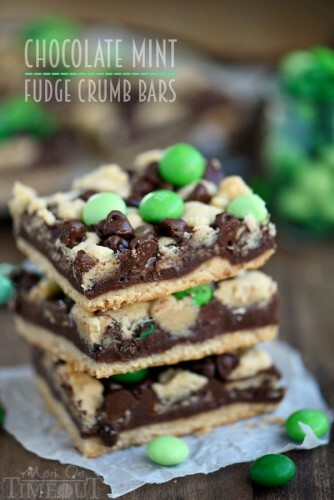 There is something about the combination of chocolate and mint that absolutely makes my mouth water. The richness of chocolate paired with the refreshing zing of mint is one heck of a combination. 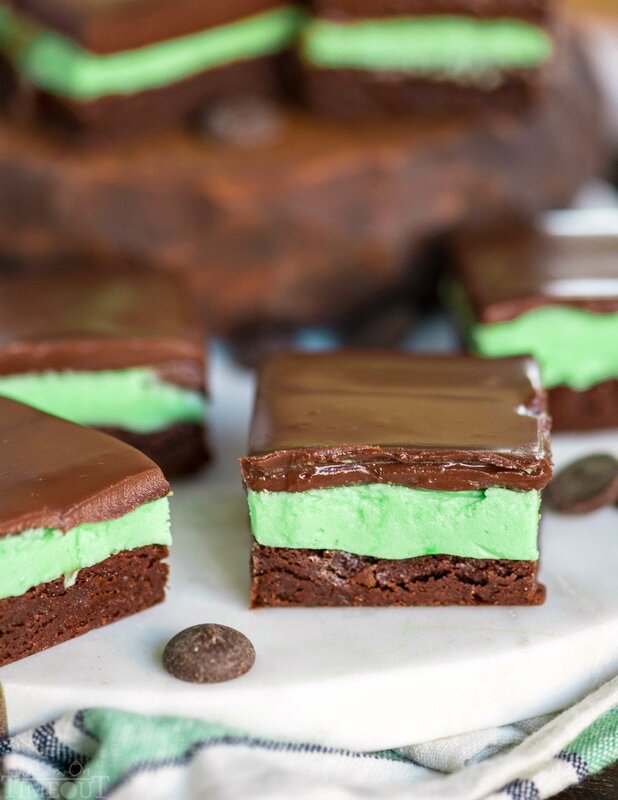 When you put them together in these Chocolate Mint Brownies and top them with a decadent layer of chocolate ganache – well, suffice it to say, it’s something magical. 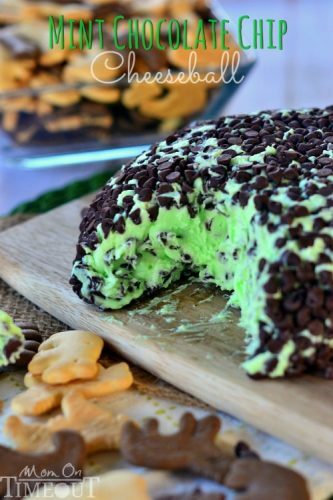 I have lots of awesome chocolate mint recipes on my site like these Chocolate Mint Cream Cheese Buttons, this Mint Chocolate Chip Cheese Ball, and these Chocolate Mint Patties. You can also check out this round up of more than 85 chocolate and mint desserts. WOW. 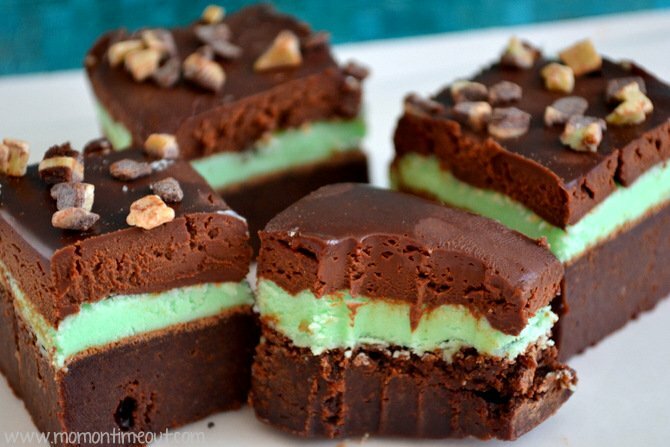 These mint brownies start off with a simply brownie layer. Don’t be fooled by the word “simple” here. These brownies are dense, moist, and incredibly fudgy. They stand on their own as an amazing brownie recipe. I do have an alternate flourless brownie recipe on my site that is another great option. (Just leave out the toffee bits). You could also use a brownie mix if you were really looking to save some time. 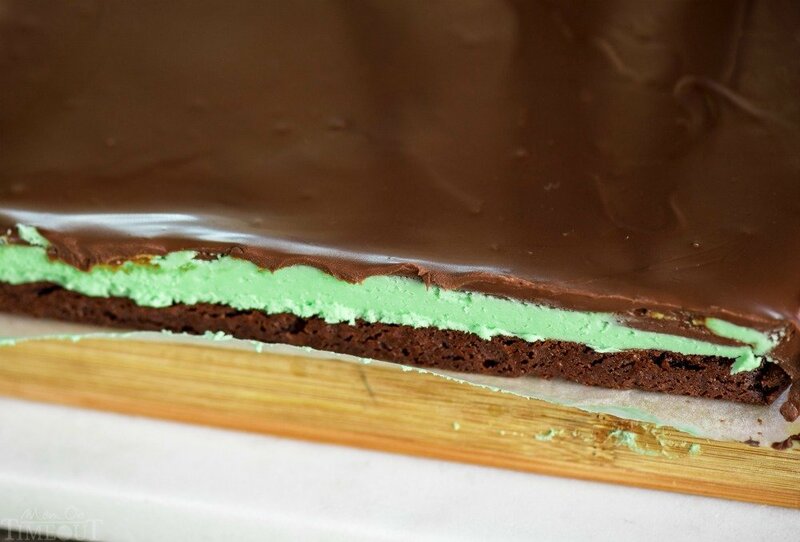 The next layer is a sweet and refreshing mint frosting. This is a great mint frosting recipe that is perfect for cakes and cupcakes – you may want to add a little more water if you don’t want it quite so stiff. And finally, the ganache. My most favorite thing in all the world. Two ingredients: bittersweet chocolate and heavy cream. It’s simply divine. The ganache is poured over the top of the chilled mint frosting layer and then back in the fridge it goes for a finally chill. When it comes out??? Amazingness my friends! 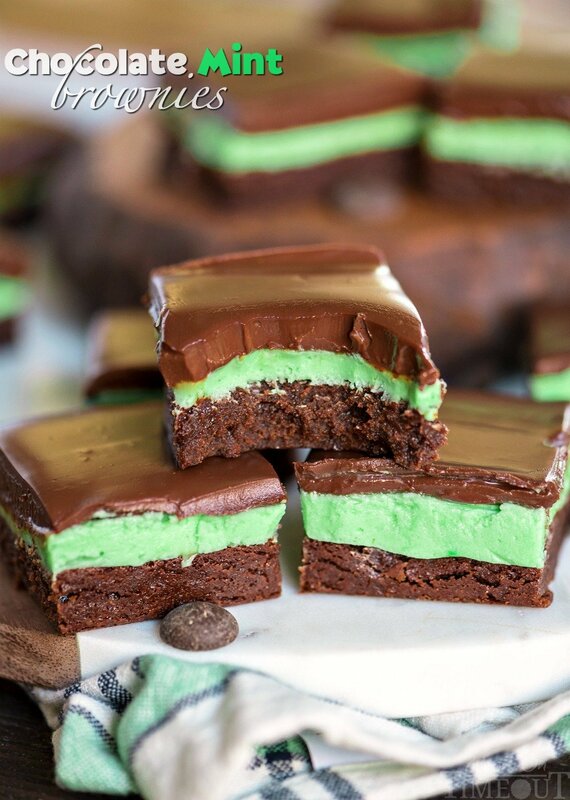 These Chocolate Mint Brownies are ridiculously delicious starting with a layer of moist, rich brownie, followed by a mint filling, and topped with a decadent chocolate ganache. Preheat oven to 325 degrees. Prepare an 8 inch or 9 inch baking dish by spraying with cooking spray and lining with parchment paper. Set aside. Using a double boiler, melt the butter, chocolate, and baking chips together. Remove from heat. Stir in the extracts and sugar. Add the eggs in one at a time making sure they are well incorporated. Finally mix in the flour and salt and beat with a wooden spoon until nice and smooth (about 50-60 strokes). Pour the brownie batter evenly into the prepared pan and bake for about 25 to 30 minutes or until an inserted toothpick comes out with a few moist crumbs. Place on a wire rack to cool completely. Whip the butter until nice and fluffy. Add the remaining ingredients into the mixing bowl and mix until nice and creamy. Spread over the cooled brownies. Place in the refrigerator while preparing the ganache. Place the chips in a medium bowl. Bring the whipping cream just to a simmer. You need to watch it carefully because once it starts to bubble it can bubble over quickly. Pour the whipping cream over the chocolate and whisk until nice and smooth. Let the ganache cool in the bowl for 10-20 minutes before pouring over the mint layer. If you want to add some Andes mints to the top, wait 10 minutes for the ganache to set up a little bit and then sprinkle on. Place the finished brownies in the refrigerator for at least another 30 minutes (I know - torture!) before slicing and serving. You will want to cut these into small pieces - smaller than your average brownie because they are seriously RICH! Store in an airtight container in the refrigerator. Originally published March 8, 2012. Updated February 24, 2018. 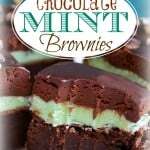 More chocolate mint desserts to try! For all mint recipes, go HERE. These look AMAZING! I wonder if the mint frosting would taste weird if I put cream cheese in it? Hmmm…sorry you had problems Patricia. I’m not sure what happened but I’ve made these brownies multiple times without issue. The foil does need to be greased with a cooking spray – that will eliminate your sticking issues and as far as the sweetness – yep, they are totally sweet. Ganache, brownie, and a powdered sugar based filling 🙂 Small pieces work best. These look amazing. Thanks for sharing! These came out delicious and beautiful. However the foil wasn’t fun to get off the bottom. I won’t do that again. Otherwise they were a huge hit ~ Very much like candy. I will be using this again. THANK YOU!! I’ve learned over the last few years that parchment paper is a better way to go. Sometimes the foil comes off easy and sometimes it comes off in a 100 little pieces -lol! So glad you enjoyed the recipe Kathleen! Made these for work a few months ago, and they were a hit! Some even told me it was the best dessert they had ever had! I wrote a step-by-step blog with the recipe–for those who had trouble with it, please check it out because they’re delicious when made right! Thanks for the recipe! !